So the so-called 'primitive' hill farmers were right after all. At the Regional Shifting Cultivation Policy Dialogue Workshop for Eastern Himalayas, held October 8-10, 2004 in Shillong, jhum (shifting) cultivation was pronounced "good for the environment, livelihoods, biodiversity conservation and food and social security." Hill farmers knew this all along. Struggling under misconceived policies that pronounced them perpetrators of the worst kind of environmental degradation in the hills, for them it was sweet music to hear international experts and government officials agreeing that jhum was the "best possible practice" for mountainous regions of the world. The workshop ended with a resolution termed the Shillong Declaration. It urges governments and policymakers to recognise jhum's immense utility and so shift policy from its current emphasis on "weaning away" hill farmers from a "primitive" style of cultivation. Policy could now turn supportive, the declaration argued, also demanding that the tenurial rights of jhum cultivators be recognised. The meet was the culmination of three years of work to document "Good Practices of Farmers' Innovations in Shifting Cultivation", which began in 2002 in Shillong at a workshop designed by the International Centre for Integrated Mountain Development (icimod) and its partners in India, Bhutan, Bangladesh, Mynnmar and Nepal. The initiative was supported by the International Fund for Agriculture Development (ifad) and the North Eastern Council (nec; the Centre's nodal agency through which money for development-related works in the northeast is channelled). 30 researchers and farmers from these countries were brought together to focus on 20 case studies covering farmers' innovations and adaptations, long marginalised by tough terrain but also mis-perception. According to icimod, case studies provided ample examples of good practices in terms of farming, forestry, soil and water conservation and biodiversity management. 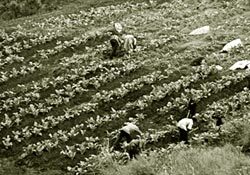 Farmers were cultivating a variety of commercial and home-consumed crops and products, it emerged. What also emerged was that current problems related to jhum were equally due to inappropriate land use practices. Jhum vs settled farming According to workshop panelist Sanat K Chakraborty, editor, Grassroots Options, what's most important about jhum cultivation is that it protects and supports collective ownership of natural resources, so also preventing land from being privatised. Encouraging 'settled agriculture' in its place -- the endeavour of current government policies -- would only hasten the end of community ownership. Experts also pointed out that current policy fails to recognise that the land left fallow is actually part of the whole jhum cycle and needs to be protected as jhum land: government classifies jhum fallow lands as 'wastelands' or degraded forest. The tenor of the discussions at the meet foxed Paty Ripple Kyndiah, Union minister, Department for Development of North East Region and Tribal Affairs. He could only promise to convince the Centre of the urgent need to operationalise the Shillong Declaration. However To many observers, the focus of the workshop seemed compartmentalised. Global experts and governments could jaw about the sustainability or otherwise of shifting cultivation, but did this provide a full understanding of how hill people the world over were increasingly marginalised? At issue was the clash of two very different systems. On the one hand, diverse small-scale traditional societies based on traditional technology and low consumption; on the other, a world-system based on global mass production and markets, high consumerism, accumulation of wealth and profit. The meeting's emphasis on "commercialisation" of small jhum plots on dwindling forest slopes, without bringing about more pressure to bear on the fragile mountain systems, deserved more study, observers felt. Growing one's own food was one thing; commercial cropping quite another. Two jhum farmers from Nagaland attended the conference. Said one of them, Lanusungkum: "After all is said and done, whatever new scheme is brought to us, it is only jhum cultivation which can sustain us and our family as we live in the steep mountain areas where terraced or settled cultivation is just not possible."